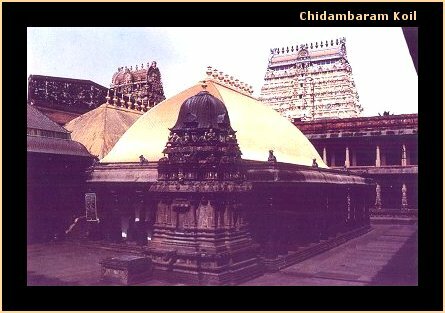 Chidambaram is the seat of the cosmic dancer Nataraja (Ananda Tandava pose ; the Cosmic Dance of bliss). It is one of the Pancha (five) Bhutasthalas. 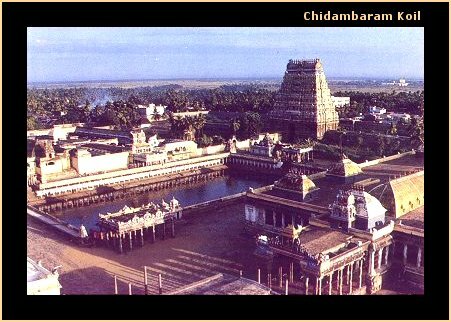 Chidambaram is the Akasa sthalam - Space. The other four are at Kanchipuram (Prithvi sthalam - Earth), Tiruvanaikaval (Appu sthalam - Water), Kalahasti (Vayu sthalam - Air) & Tiruvannamalai (Thejo sthalam - Fire). The temple was in vogue for centuries,but its known glory in records begins with the visit of Hiranya Chakravarthi of Kashmir around 500 A.D. 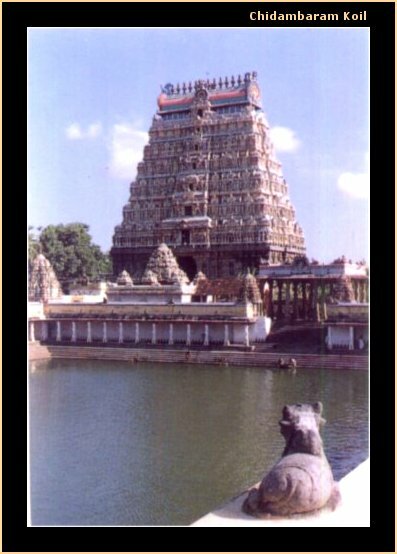 The king is said to have been cured of his leprosy with a single dip in the temple pushkarini, Sivaganga thirtham . The four great saiva acharyas Appar, Sambandar, Sundarar and Manikkavachakar are connected with this holy temple and produced master pieces eulogising their respective paths - Charya, Kriya, Yoga and Gnana. This kshetra is said to have given liberation to several hundreds of devotees - notable among them are Nandanar, Tirunilakandanayanar, Vyagrapada, Patanjali. The idol of Nataraja is enshrined in the Chit sabha. Behind this idol, is a black screen, which is considered to cover the Akasa Lingam. There is no Lingam, but we are made to believe that there is an invisible Lingam, with golden vilva garlands, i.e stressing the belief that there is everything in nothing. There are five silver plated steps to reach the Chit Sabha, representing the Panchakshara mantram - Na ma si va ya. The embossed images of the saints Vyagrapada and Patanjali, are to be seen on the doors. Both these saints had been blessed with the sight of the cosmic dance of Shiva. Lord Vishnu also is said to have witnessed this scene. In the Kanaka sabha (golden hall) lying adjacent to the Chit Sabha, poojas are offered. The ceiling of these two sabhas are gold plated. The Nritya Sabha, which is richly sculpted in the form of a chariot drawn by horses houses the images of Nataraja in Urdhava Tandava pose, image of Sarabheswara. The Deva Sabha is a spacious hall meant for the celebration of important festivals and houses the festival images of the Pancha Murtis (Somaskandar, Parvati, Vinayaka, Subramanya and Chandikeswara) and other deities. The Raja sabha measuring 103 metres by 58 metres is housed in a 1000 pillared hall in the outermost prakaram. Tradition holds that Sekhizhar recited the Peria Puranam here. The shrine for Govindaraja Perumal. The representations of many famous Siva Lingams associated with different temples in India. The Vinayaka idol blowing a conch. The huge Ganesha in the outer prakara considered to be one of the biggest in India. The temple of Sivakami Amman in the outer prakara, with its beautiful arch with sculptural beauties. The Subramania temple next to the Ambal temple. Durga temple adjacent to this. The Annamalai University is located here. Chidambaram is on the Chennai Tiruchirappalli Main line, between Villuppuram and Thanjavur.